Paddy McNair's return to the Northern Ireland squad marks the end of a turbulent period in the young footballer's career. After being sidelined for almost a year with a knee injury, the Sunderland player has been recalled for the World Cup play-off against Switzerland. McNair, 22, ruptured his cruciate ligament during a Premier League match against Hull last November. "It's great to be back," he said. "It's great to feel like a footballer again." "It's been a long, frustrating 10 months," he added. "Obviously I've got my friends and family and they help to keep me upbeat. There are times when you are really frustrated and you don't really want to talk to anyone but it's just part of the game I think." After a handful of matches for the reserves, the former Manchester United star made his return to first-team duty for Sunderland with an 11-minute cameo off the bench during the 2-1 loss to Bristol City on Saturday. "I've gone into the game without even thinking about my knee," he said in the build-up to the match at the Stadium of Light. "I don't feel any pain, I don't feel like it's restricting me. I didn't want to come back in and feel like it was holding me back in anyway so I'm delighted with that." Following his timely return for the Black Cats, Northern Ireland manager Michael O'Neill had no hesitation in selecting him in an extended 27-man squad for the crucial play-off against Switzerland at Windsor Park on 9 November and the away leg in Basel three days later. "It's important for Paddy to be involved but he will be assessed," O'Neill said. "For Paddy to be out has been difficult for him. It's important he is with us. We don't expect him to start but hope he can be involved." 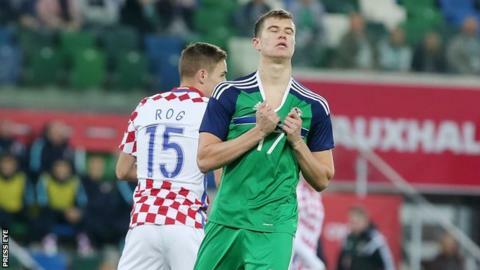 After he was part of the 23-man squad for Northern Ireland's historic Euro 2016 campaign, McNair had kept in regular contact with O'Neill throughout his injury lay-off, demonstrating how highly he is rated by his international manager. "I've spoken to him (O'Neill) a few times," McNair said. "I've just been taking it game-by-game but if I've been involved in a couple of games before the international break then hopefully I'll be available for selection. "It's been a very exciting few years for Northern Ireland and missing out on that in the last year has been really hard but it's great to see the lads doing so well."